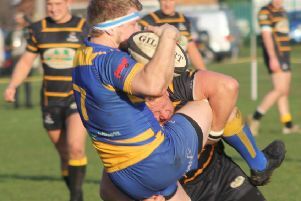 Old Leamingtonians continued their winning sequence with more open rugby producing another seven-try performance against opponents whose expansive game also yielded five tries. OLs took the game to Ledbury from the kick-off and forced the hosts back into their own 22 but solid Ledbury defence prevented the visitors from capitalising on good forward play and quick ball along the line. The teams go in for huddles. 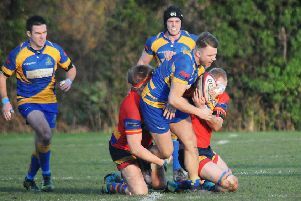 However, their persistence paid off after 12 minutes when a sweeping move saw the ball played out to wing Liam Wellings who forced his way through a number of defensive tackles to cross the Ledbury line wide out. The conversion by Henry Reynolds was successful. From the restart,OLs maintained their pressure and three minutes later their forwards forced Ledbury back towards their line, enabling back-row Ollie Sarginson to force his way through the defence to touch down for try number two, again converted. The visitors began to establish superiority over the home forwards and created some good running moves that stretched the home defence and further tries followed. A second try from Wellings after a fine interchange of passing from the three-quarters increased their lead before Ledbury hit back with a well-taken converted try to reduce the deficit. This served to trigger a series of strong forward drives from OLs that ended with back-rower Hugh Melhuish storming through to touch down for the first of his two tries. The conversion followed to give Old Leamingtonians a comfortable 26-7 interval lead and a crucial bonus point. The second half started with Ledbury changing their game-plan to utilise their pacey three-quarters and this, coupled to a ten-minute period of poor defence and indiscipline from OLs, allowed the home side to run in two well-taken tries, one of which was converted to reduce the lead to two points. A tactical change from OLs brought their forwards into game and allowed them to reassert pressure on the home side. They were rewarded when good forward play was quickly capitalised on to free up the three-quarters, allowing Calum Semple to force his way through to touch down for a pivotal score. The game swung back in favour of OLs with their forwards gaining control and a period of pressure on the home defence ended with Melhuish forcing his way through to touch down. The game continued to be played mainly in the home half and OLs’ final try of the afternoon followed late in the game, centre Ben Perkins crossing. With the game entering time added on, Ledbury had one final flourish that ended with a consolation try that went unconverted.